This is a set of 3 Fire King Swirl Pink 7 5/8" Salad Plates. They are signed Oven Ware Fire King. 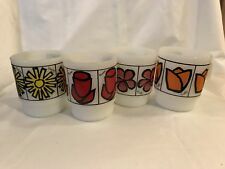 This is the complete set which includes the Daisy, Rose, Violet, and Tulip mugs. This is a charming set and would be a treasured addition to any retro kitchen! 1 REFRIGERATOR DISH AND LID 8.25"S LONG, PEACH BLOSSOMS BY ANCHOR HOCKING. FIRE KING PINK FLOWERS AND GREEN AND GOLD LEAVES. ONE ONE QUART LOAF PAN. MID CENTURY. HAND PAINTED. CHECK OUT THE GOLD LEAVES. EXCELLENT FIRED ON COLOR. EACH STANDS 6" TALL. Bright peach pinkish color. These have a fluted base for stacking. Pink mug does have minor rim wear (pic #5). It is in very good used condition. Turquoise mugs are in excellent condition. ③オークションのスタートが＄９．９９で単品。セーラーの所在地の州名が記載されていない。また、送られてくるパッケージに記載されている住所はPO BOX（私書箱）。. For Sale is a Lot of 3 Fire King PINK Peach Blossom 2-Cereal Chili Bowls & 1- D Handle Coffee Mug Gay Fad Pattern. 3 Fruit Bowls. 3 Coffee Cup Plates. Gently used condition, light scratches due to wear. For sale at a fixed price is this great 1950s Anchor Hocking Fire King Pink Swirl. Condition is used but excellent. Vernon Nokes, P.O. Box 270048, Littleton, CO, 80127. The floral 'Anniversary Rose' bowl is marked Fire King USA. It is a stacking mug with a lovely pink soft shade "Rose-ite" color. Color shading and wrinkles, etc. is the texture and characteristics possessed by the milk glass. Like the Jade and the turquoise blue, the color is mixed into the glass. They are in used shape with minor wear from storage. If the picture does not load. This is a 2 1/8" tall x 3 3/4" wide cup in the Princess Pink depression glass pattern by Anchor Hocking. The green bowls have color throughout and the yellow and pink are colored outside with white interiors. This is a Fire King Primrose 8 piece Snack Set. They are not signed. See both closeup pictures to see differences. Item: Chili Bowl height 2 1/4 in. Stamp: Oven Fire King Ware Made in USA ( Fire King is written in script) 1951-1960. Material: white milk glass inside. It is not noticeable unless one is looking close up for flaws. Sweet primrose milk glass casserole by fire king mid century in outstanding condition. Keep checking back - it will take a while to get everything listed. I've got lots of stuff in addition to clothing! I do my best to list any major flaws that I notice. I acquire my inventory from a wide variety of place, and I can't say whether or not the previous owners smoked or had pets. Fleurette pattern. 2 Sugar bowls, no lids. Fire King Ware. Made in USA. Set of 4 – 5” dia berry or fruit bowls. The pattern is classic midcentury Fire-King Pink Swirl from Anchor Hocking. With the 1950s mark “OVEN Fire-King WARE MADE IN U.S.A.” Fire-King in script lettering to each. This is one lot of several I currently have listed in this pattern, for combined shipping click on "view sellers other listings" link to see the others. Fresh from a fine old Denver estate, and offered with No Reserve. Condition is excellent to near mint overall showing the lightest of use with no chips, cracks, repairs or other damage. With all dinnerware condition is guaranteed should I overlook any flaws. This is a set of 3 Fire King Peach Blossom D' Handle Mugs. They are signed Anchor Hocking Fire King Ware USA with and Anchor. Both say heat proof. Other than the stamp on the bottom, the bowls are identical. So you may get a federal one or a westfield one. I tried to take a picture of the worst ones in each group. There is a tiny chip along the side of the handle. It is Clear Glass with a fired on color. Because of the Age. I always mark used in the first box. Here is a set of 3 water tumblers which have the Wrought Iron design on them, this set was a go along with the Fire King pink swirl. The tumblers are 4 3/4" high and 2 3/4" high and hold about 12 ounces. Vintage Pink Swirl Fire-King Large Vegetable Bowl FireKing Rare. 8 1/4” Wide Rim. Mint condition! Beautiful Pink Swirl Color. Hard to capture with photo. Very unique. More Pink Swirl Available. PINK SWIRL. SET OF 5 PLATES. #409 WHITE MILK GLASS LOAF BAKING DISH. APPRX 10.50"S LONG AND 5.25"S WIDE AND 2.50"S TALL. WHAT MAKES THIS RARE IS GOLD LEAVES AND REVERSE HALLMARK.HAND PAINTED GAY FAD STUDIOS. Would fit a dish that has an opening of 9.75". Vintage Pink Swirl Fire King 9" Dinner Plates Lot of 6. Beautiful Set Of 6 Pink Swirl Dinner Plates. Only 1 Previous owner. All are in great condition and free of cracks or chips. Nice set of 8 berry bowls (4.5" diameter) by Fire King in Anniversary Rose. Gold is slightly worn on 4 of the bowls. The bowls we're never used - no utensil marks at all. See pics.